Looking for a unique addition to your walls? A diptych is two canvas prints, with one image split across them, creating an eye-catching addition for any room. Two canvases hung together side by side can really add to your photographic storytelling. Our Diptych presents two images: either 1 image split into 2 (such as a landscape) or two separate shots from consecutive moments. A before and after? Mini sequence? Or one landscape tastefully divided into two parts for a cool wall art display? The set-up is completely up to you and your creativity. When you mount or install them, you can slightly separate them with a slim gap to add a little artistic feel. Whatever way you decide to go, the end result is a very pleasing art piece showcased on your wall. 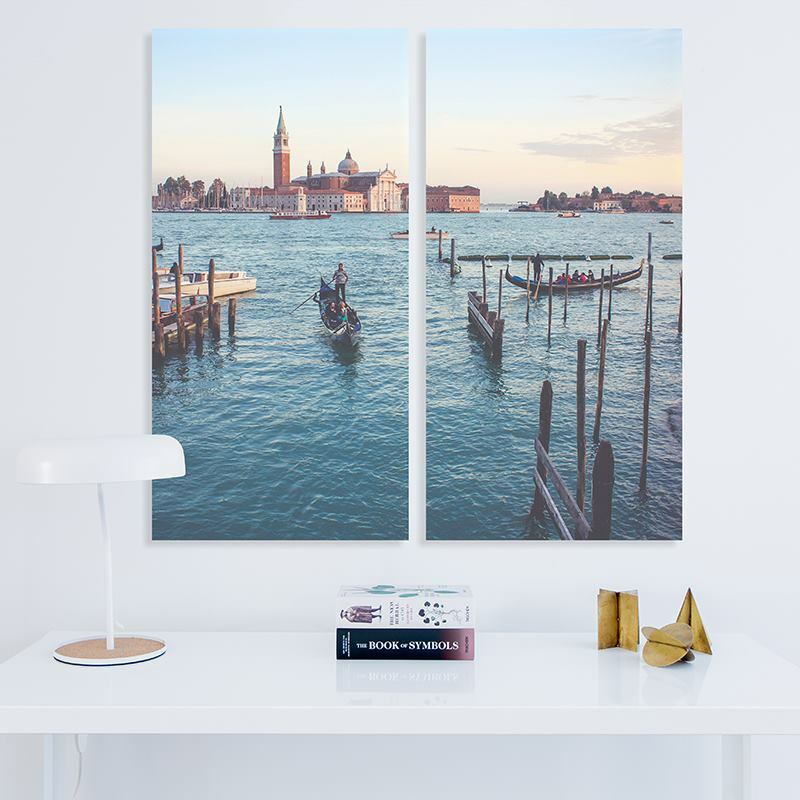 As with many of our products, you can benefit from our great quantity discount when purchasing these diptych canvas prints. Order three sets, of the same or differing sizes, and the lowest priced one will be free. The discount is automatically deducted from your basket to make sure that you don't miss out - so you don't even need to do anything. The eye-catching and thought-provoking aspect of the diptych makes these installations different and interesting. Once you have designed yours using our online design system, you can preview on the canvas itself, to see exactly what it will look like before you place your order. Once you are happy, submit your order and we will print your design onto out high-quality woven fabric. This material will be hand stretched over a frame which has been handmade to your size specifications using FSC certified pine wood. We will secure your split canvas prints in place with wedges and stretchers, also made from FSC certified wood. The edges of your design will be mirror wrapped, meaning that your design will be mirrored to wrap around the frame, to avoid leaving white edges. There are so many great ideas for diptych canvas prints we struggled to choose just one. A before and after, mini-sequence or one landscape tastefully divided into two parts for a cool wall art display are just a few of our favorite ideas. Why have 1 canvas when you can have 4? This stylish Multi Panel Canvas Print is available in several sizes. Can't choose between three photos? This one's for you.